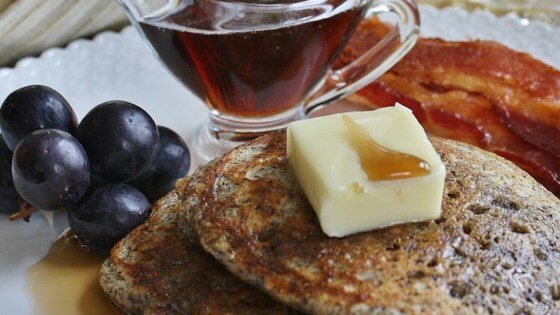 "These are delicious buckwheat pancakes that taste great with some butter and syrup or jam." In a medium bowl, whisk together the buttermilk, egg, and melted butter. In another bowl, mix together white flour, buckwheat flour, sugar, salt and baking soda. Pour the dry ingredients into the egg-mixture. Stir until the two mixtures are just incorporated. Heat a griddle or large frying pan to medium-hot, and place 1 tablespoon of butter, margarine or oil into it. Let the butter melt before spooning the batter into the frying pan, form 4 inch pancakes out of the batter. Once bubbles form on the top of the pancakes, flip them over, and cook them on the other side for about 3 minutes. Continue with this process until all of the batter has been made into pancakes. A great pancake with 100% buckwheat flour! These are really good. My whole family loved them. Best if you let the mix sit for a bit to make lighter, fluffier pancakes.